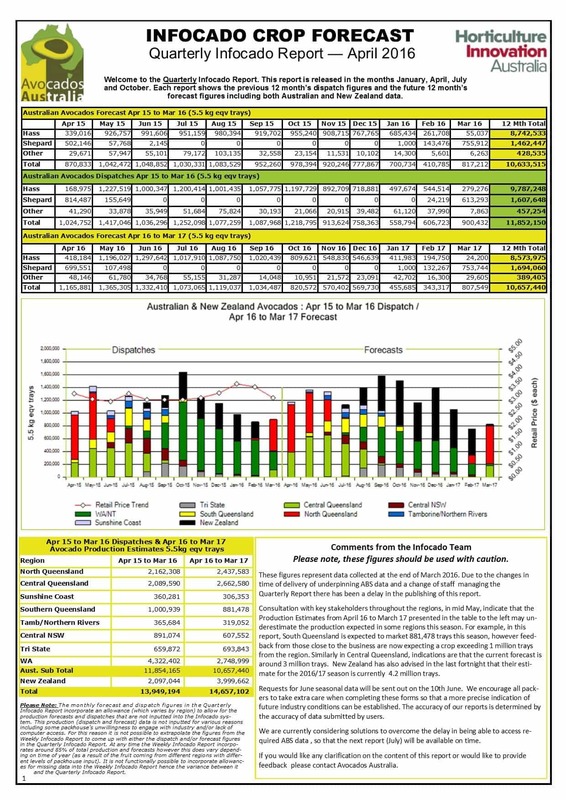 Infocado is Avocados Australia’s web-based system reporting volumes of avocados dispatched and forecast to be supplied. Short-term data is reported weekly, and seasonal data is reported every three months. This data assists the industry to supply avocados more consistently throughout the year, thus helping optimise fruit quality at retail level and support a more stable market. The data also assists with planning industry marketing activities throughout the year. Avocados Australia developed the Infocado system for the industry’s benefit and there is no cost to participate in the program. If you would like to participate in the Infocado system please contact us. This report is produced in January, April, July and October from data provided by growers, packers, consolidators and NZ exporters. 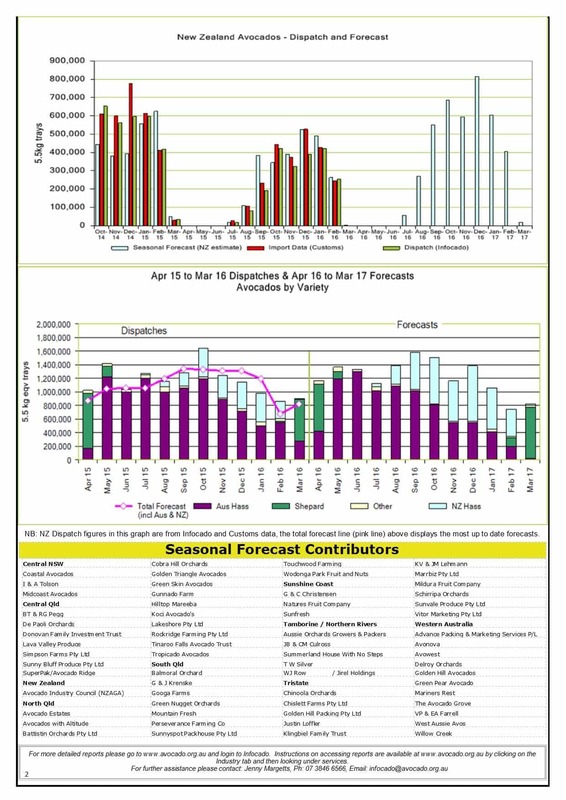 It provides forecast volumes by month and by region for the coming 12 months for the Hass and Shepard varieties. It also shows the volumes dispatched regionally and monthly over the past twelve months for Hass and Shepard, as well as the average retail price per month. This report is provided to all contributors as soon as it is available and loaded on this website for wider access six months after publication. This report is produced weekly on Tuesday from aggregated data provided by packers, consolidators, wholesalers and NZ exporters. It provides volumes dispatched in the past week by variety, pack type and fruit size and volumes forecast for the following four weeks, by variety and pack type. The dispatch data also shows the region of origin and the destination state, by pack type and fruit size. For each region including NZ, the report tracks dispatch progress across the year compared with the original volume forecast at the beginning of the season. It shows the national volume of sales each week and closing stock, as well as the major supermarkets’ online retail prices. This report is provided to all contributors as soon as it is available and loaded on this website for wider access six weeks after publication.